After the long weeks of waiting Professional Regulation Commission finally released the result of Licensure examination for teachers (LET). The takers of 12,103 passed the examination out of 44,144(27.42%) for Elementary level while 17,904 passed from 56,596(31.63%) takers for Secondary level. LET was done on March 29, 2015 in various testing sites all over the country sych as in Manila (NCR), Cagayan De Oro, Cebu, Baguio, Davao, Iloilo, Legazpi, Tacloban, Tuguegarao, Lucena, Pagadian, Catarman, Jolo Sulu, Bongao Tawi-tawi, Antique Catanduanes, San Jose, and Zamboanga. While PRC conducted the board exam, it is the BPT that created the test. BPT is composed of Chairman Dr. Rosita L. Navarro and three members Dr. Nora M. Uy, Dr. Paraluman R. Giron and Dr. Paz I. Lucido. 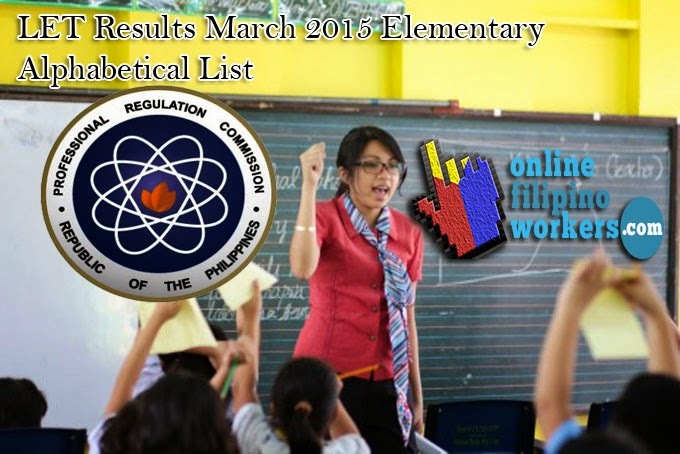 Here is the F - O Final list of passers for Elementary Level.